Uganda used to be home to black and white rhinos. Tragically, wars and excessive poaching in the late 1900s saw a dramatic decline in their numbers, with the eventual extinction of both species in the early 1980s. Both rhinos used to be commonplace in this country, and ever since their disappearance, there have been calls for reintroduction. The Oyster Worldwide volunteer project takes place at a sanctuary which is hoped to be the first phase of this reintroduction work. This project is all about the increasing the population of rhinos in Uganda, with the hopes that it will continue to grow as it has done over the past few years. The sanctuary is now home to almost 20 rhinos – their numbers have flourished over the past 10 years alone, when the sanctuary was created with just 3 rhinos. This is a trend which everyone is anxious to see continuing, and to enable this, data is collected daily about the rhinos in care here. Volunteers at the sanctuary help with a variety of tasks, and one of these is the data collection. Data is incredibly important, as it helps the staff to identify the health and needs of the resident herd, whilst also learning more about this ancient species. This is especially key given that, despite all efforts to make the reserve as close to the wild as possible, it is still relatively artificial. There are none of the natural rhino predators for example – such as buffalo and hyena which often go for the baby rhinos- and as such their lives are stress free and relatively easy. Because of this, the females are giving birth with far more regularity than in the wild – every two years rather than every 3.5 years. This success is fantastic, however it is problematic within itself, as the gene pool is much smaller than it should be. 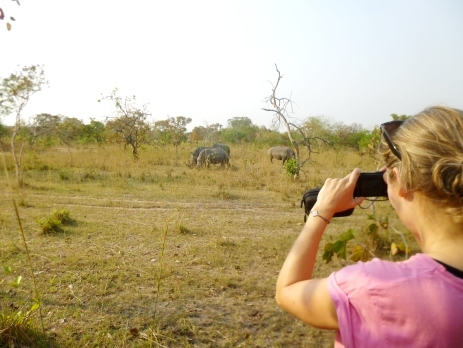 How can data collection help the rhinos in Uganda? Recently, it was noticed that the adult bulls at the sanctuary were attacking young female rhinos and juvenile bulls, and the decision was made to monitor this closely to gain an understanding of why this was happening. After many months of data collection, it was noticed that the three bulls were extremely dominant and were causing great problems for the females and their offspring. Fights for dominance were constantly breaking out between the males, and they would often overpower the females to assert their dominance. Tragically, after one stand off between a bull and a juvenile, the juvenile was overpowered, turned tail to run and trapped his foot in an aardvark hole. He broke his leg and the amount of stress that he was under meant that he did not have long to live. 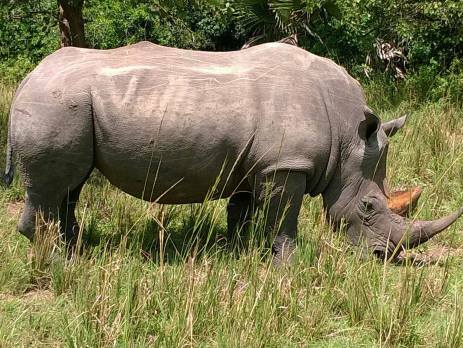 Tragically, these rhinos are the only ones living in the wild in Uganda, and to lose one is a travesty. After this, the hard decision was made to de-horn the bulls, in the hopes that this would reduce their need to dominate (the horn plays a huge role in this). Following on from the de-horning, the females are now stronger and the juveniles growing up in safety. The females are now able to copulate when they are ready, rather than being used for a tool to demonstrate dominance. This test has paid off, and can all be mapped through the data collected. 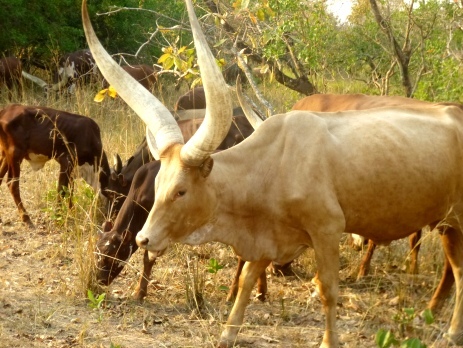 The cattle keep the grass short, which helps the rhinos to graze. A rhino‘s head is so large they struggle to lift them high enough to eat long grass. Rhinos are grazers (grass only). Cattle are browsers (mainly eat branches and bushes). Pythons live in bushes. The sanctuary is much clearer of bushes now, making tracking safer and easier. Cattle grazing reduces grass thickness and helps to prevent fires from spreading. To find out more about this project and volunteering with rhinos in Uganda, visit our rhino conservation webpage. Next Post How Christmas is celebrated around the world? Previous Post Oyster are looking for trip leaders this summer! Hi there, thank you for your message and interest in the Uganda project. The upcoming dates that we have are February 19th – March 5th and 14th May – 28th May. Would either of those work for you both? The project lasts for 2 weeks and costs £1695 per person. Do let me know if you have any other questions at all – you can email me on [email protected] or give me a call on +44 (0) 1892 771 975.